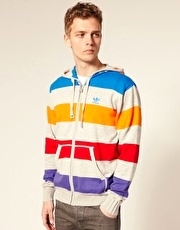 Produktbeskrivning för Adidas Originals Stripe Hoodie: Stripe hoodie by Adidas Originals . Featuring a colour-block stripe finish with a lined hood and drawstring ties, a zip front fastening, long sleeves with knitted rib cuffs, embroidered brand detailing to the chest, a large split front pocket and a fitted hem. ABOUT ADIDAS ORIGINALS With a brand history stretching back over 60 years, Adidas Originals draw inspiration from street culture and retro styles to provide fresh vintage inspired menswear. The Adidas Originals Watch Collection focuses on vibrant styles and designs with a mix of digital and analogue watches.